On August 27, 1992, the Kirk Family had the honor of hosting President George H. W. Bush who spoke to a crowd of 2,500 from the factory floor of Findlay Machine & Tool’s newly expanded production facility at 1950 Industrial Drive in Findlay, Ohio. 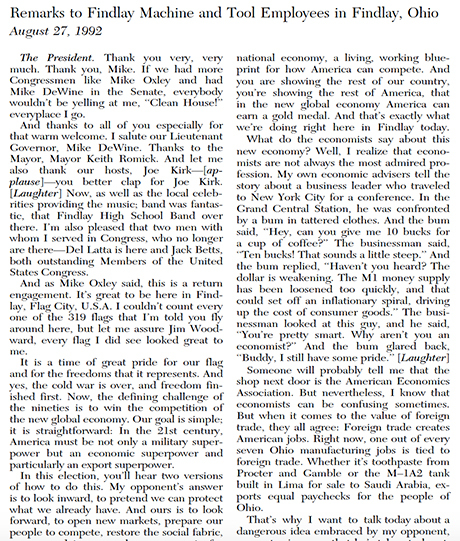 Bush’s speech, which lasted 19 minutes, covered issues of free trade, tax relief, and small business development. The full text of this speech is now published within his archives of the George Bush Presidential Library and Museum at Texas A & M University. Thank you very, very much. Thank you, Mike. If we had more Congressmen like Mike Oxley and had Mike DeWine in the Senate, everybody wouldn’t be yelling at me, ‘‘Clean House!’’ everyplace I go. And thanks to all of you especially for that warm welcome. I salute our Lieutenant Governor, Mike DeWine. Thanks to the Mayor, Mayor Keith Romick. And let me also thank our hosts, Joe Kirk—[applause]—you better clap for Joe Kirk. [Laughter] Now, as well as the local celebrities providing the music; band was fantastic, that Findlay High School Band over there. I’m also pleased that two men with whom I served in Congress, who no longer are there—Del Latta is here and Jack Betts, both outstanding Members of the United States Congress. And as Mike Oxley said, this is a return engagement. It’s great to be here in Findlay, Flag City, U.S.A. I couldn’t count every one of the 319 flags that I’m told you fly around here, but let me assure Jim Woodward, every flag I did see looked great to me.